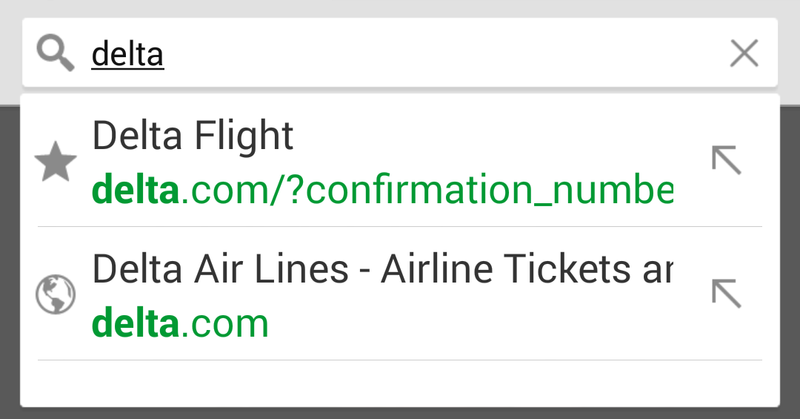 What do you do when you get that confirmation number after booking an airline ticket? Do you write it on a Post-It note? Lot of good that will do you when you are rushing to the airport. Do you just ignore it and trust that you got everything in an email? If your email is like mine, you may have a hard time finding it when you need it. Use the arrow on the right side to move the address to the address box rather than navigating straight there. Then you can select and copy just the confirmation number and have it ready to paste into the "Online Check In" form. This is useful for lots of things. I use it for anything that I know I'm going to want to remember when I'm in a browser. I use Evernote, but not for this. I don't need the extra steps of going to the website on my phone, launch Evernote, find the note, copy the confirmation number, switch back to the browser, then paste. **then add - I say this because sometimes the address you type. For example delta.com, gets redirected to a different address, like www.delta.com, and the query string may get lost. This is not the case with Delta, but it may be with others. I am moving entries of my old one-liners text file to a web page for easier access. tar cvf - $files_and_dirs_to_send | gzip | ssh $destination_server "cd $destination_dir; tar zxvf -"
tar cvf - $files_and_dirs_to_send | gzip | ssh $destination_server "cat > $destination_dir\archive.tar.gz"
## I configure my router to forward $secret_port to port 22 on my machine. ## Now we are both looking at the same shell. We can both type and collaborate. sudo date -s  "$(ssh user@server.com "date -u")"
# That is Base64 [/+a-zA-Z0-9], but you can add a substirution  to the sed.